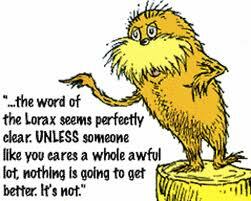 WAS Dr. Seuss ahead of his time? Thing is, this book was written long ago, so the message has been circulating for quite some time. Is it coincidence that the message has been taken one step further by reaching the big screen in 2012- The Year Of Awakening? Personally, I think it’s perfect timing. How about you?